There’s something about Art Bra that just brings out the tun and creative side to people, so it’s no wonder that these women — all breast cancer survivors — couldn’t choose between creating an Art Bra and modeling one. Opting to do both, these creative powerhouses were able to design a bra that not only fits their own bodies, but their personalities as well. We are so inspired by their creativity, and can’t wait to see them on the runway. A 1-year survivor, Anna experienced a void in open conversation about breast cancer and its treatment when she was diagnosed, particularly in her Christian community. As a result, she is moved to encourage women to talk not only about breast cancer, but their bodies and the importance of taking care of them. Anna was inspired by the Biblical story of Esther, a woman who had the courage to stand up for social justice. 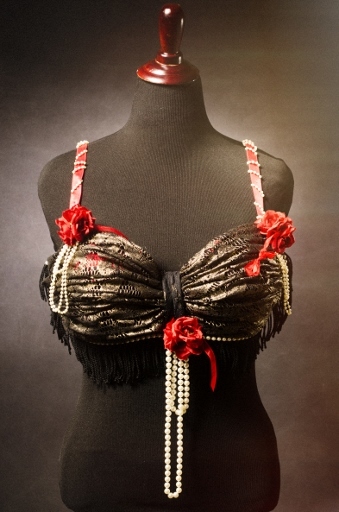 She used Duoplex fabric, foam, lace, a string of pearls, decorative ribbon and decorative roses to create this gorgeous bra — all while going through intense cancer treatment! She dedicates this bra in honor of her mother, also diagnosed with breast cancer, and her grandmother. Anna will be modeling this bra under the name Zelda Botha, and created a second Art bra titled “Hook ‘Em Horns” for another lucky model. In remission since 2013, Jeanne is originally from New Jersey but has lived in Texas most of her life. She loves playing sand volleyball, camping, crocheting and is excited about the rest of her life’s journey. After being inspired by a male Art Bra model last year, she created “He/She” to underscore that breast cancer affects both men and women. 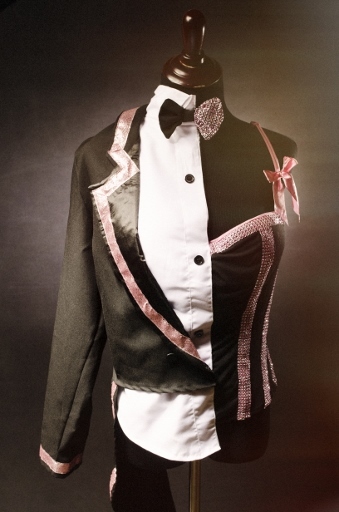 She used a variety of sewing notions to create a black and pink tuxedo on one side with a coordinating bustier on the other — a clever look to poignantly express one of breast cancer’s truths. A 1-year survivor, Florence’s entire life has been creative — from her degree in Art Education to her former jewelry business and avocation as a belly dance instructor. She created this stunning bra by using glass beads and two polished abalone shells, using notions from her jewelry making and costume making days to complete it. Florence says that, upon being diagnosed, “the emotions ran as deep as the ocean, accompanied by a feeling of drowning. Throughout this journey, I have learned to immerse myself in hope and gratitude.” She also created matching earrings and a necklace to accompany her bra, and we can’t wait to see her model it! A 1-year+ survivor, Beverly describes herself as positive, artistic and spunky — all qualities that are easily seen in her bra creation. Titled “Day of the Living!”, Beverly’s bra is a twist on the Hispanic tradition of the “Day of the Dead” (Dia de los Muertos), and she says she was inspired to create a bra that celebrates breast cancer survivors everywhere. 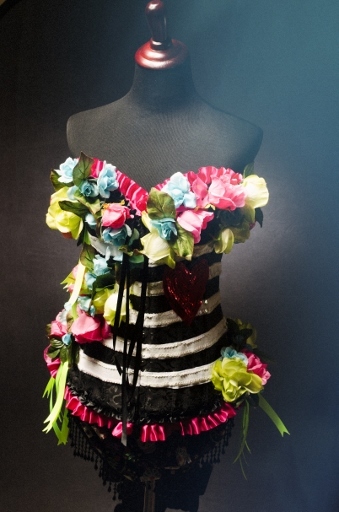 She used felt, sequins, glitter paint, ribbon, silk flowers and netting to embellish a black corset, and attached a “Girls Just Wanna Have Fun” sign to the back of the ensemble. It is accompanied by a sparkly netting skirt, and black tights and gloves with a skeleton motif on them. Beverly thanks her friend, Cindy Johnson, for helping her to create this colorful and exuberant costume!